One month ahead of its 23 May opening, the names of several more tenants for Gateshead’s £150m Trinity Square development have emerged. The most recent brochure for the Tesco-led regeneration scheme, dated September 2012, features the logos of Sports Direct, CeX, Subway and Poundland, indicating that they will be joining the already confirmed occupants of Greggs, Ladbrokes, Phones4u and Costa. Meanwhile, Tesco’s own 103,000 sq ft Extra store, which will open at 8am on 23 May, is set to feature the latest version of its F&F clothing department, as recently trialled at some of its London stores. A further 15 units are shown as ‘under negotiation’ and 12 as ‘available’, suggesting that a large proportion of the scheme will be let by the time it opens four weeks on Thursday. This brochure version of the letting plan is, incidentally, significantly more up to date than the one on the Trinity Square website, which hasn’t been updated for some time. 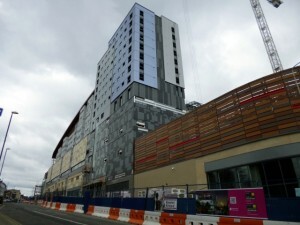 Elsewhere on site, work will continue to complete the 9-screen Vue Cinema, which is expected to open towards the end of the year, and the 993-room student village for Northumbria University – built on top of the Tesco Extra store – which will welcome its first occupants in September 2014. Of the stores signed up to date, Sports Direct is particularly welcome because it will be an entirely new name to Gateshead town centre. 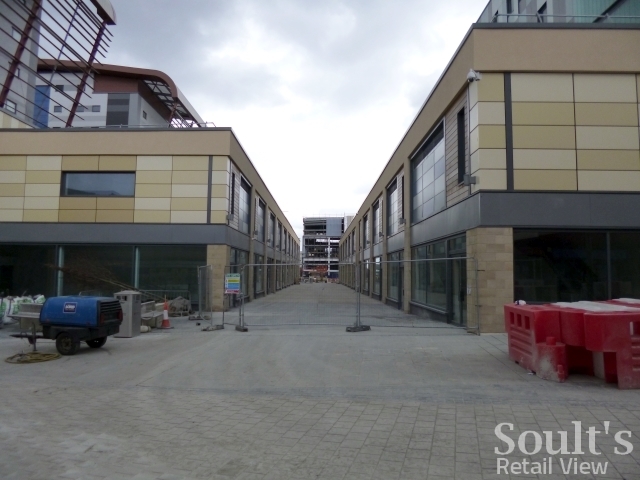 In contrast, Subway, Greggs and Ladbrokes are all already represented in the town, though it’s not clear at this stage whether the Trinity Square stores will be additional branches or relocations. 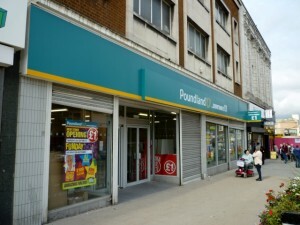 Poundland, too, will in all probability be relocating from its existing premises at 232-240 High Street, meaning that the 6,127 sq ft former Woolworths site will once again become empty, as will the former Kwik Save opposite, at 241 High Street, that Tesco has been using for its temporary store. 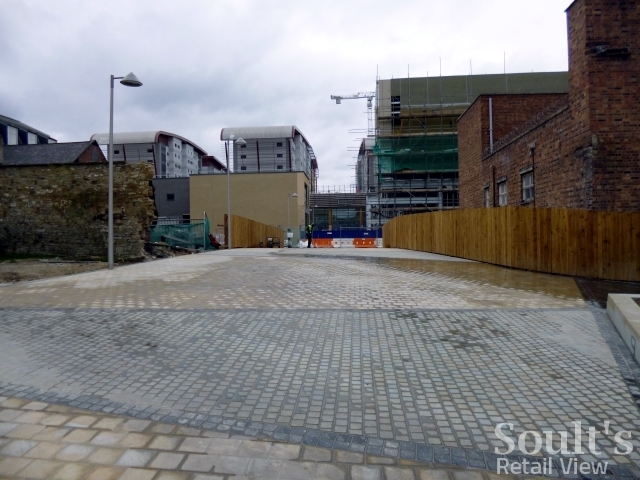 Though the number of potential relocations has prompted some to express concerns about Trinity Square’s immediate impact on the existing town centre, it’s hard not to conclude that the overall picture is a positive one for Gateshead. 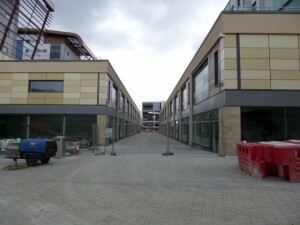 In Jackson Street, for example, Pure Gym, Wetherspoon, Ponden Home and the reopened Peacocks have all taken space in the former Co-op building in the last 18 months – in full knowledge of the Trinity Square plans – while Bewick Way, the new pedestrian link between the two, will knit Jackson Street into the scheme in a way that was never the case before. Similarly, it’s hard to imagine the existing Poundland and temporary Tesco units being empty for long. Given their proximity to the new scheme and the extra footfall it will bring, there’s a strong likelihood that they will appeal to prospective new retail or leisure tenants, perhaps attracting expanding value retailers who are not currently represented in the town centre, such as Discount UK, Boyes, 99p Stores, B&M Bargains or Mountain Warehouse. 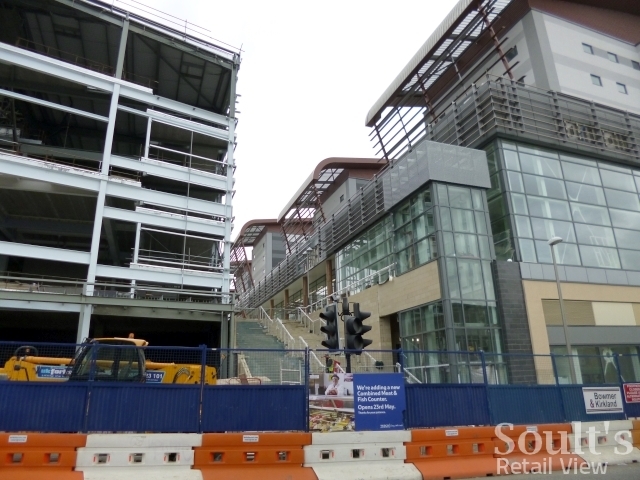 Given the general pressure on Britain’s high streets at present, and the fact that Gateshead’s retail heart has been a Tesco-less building site for the last year, the continued busyness of the town centre on a typical weekday is remarkable. On the last two or three lunchtimes I’ve visited, for example, I’ve struggled to find a seat in Wetherspoon’s, thanks to it being packed with shoppers laden with their Iceland, Home Bargains and Poundland bags. Clearly, Gateshead town centre can’t compete with Newcastle city centre or Metrocentre in terms of the scale, quality or breadth of its retail offer, but then nor can other nearby retail centres such as Jarrow, Blaydon or South Shields. For everyday shopping, however, many consumers still value a convenient, compact, local offer that’s on their doorstep, complementing more occasional trips to the big mall down the road. As a town centre that performs that local function, I’m pretty confident that Gateshead has a successful and exciting future – and we don’t have long to wait now to experience the next phase of that rejuvenation. I would love there to be a Nandos there!!! Have noticed there are a lot of retailers moving from the block on the corner of High Street Jackson Street, maybe this corner could be released to provide further development? True! The corner building there is deeply unattractive (the Woolworths building next door slightly less so). I’d very much like to see the old Burton building (next to the cinema) restored too – it’s rather handsome, but has been spoilt over the years through lack of maintenance, awkward subdivision, and unattractive shopfronts and signage. I do hope we get some exciting new shops in Gateshead, although some have mentioned relocating into Trinity Square the Rent is very very steep, and for most small businesses will be impossible to break even. I am interested in the future for the Tesco Temporary store which seems a success, when buying odds and ends a do hope they keep it as a mini express supermarket, as its much quicker for shopping rather than running into a massive supermarket for milk or sugar! Yes, at least the development should be reasonably well populated by opening day, which is good news. Also now confirmed Moffee Coffee, Anzac Hair & Beauty (relocation), Albermarle Bond (relocation) , Frankie & Benny’s & Supernews! Nice to see some positive commentary on Trinity Square. It’s getting a bit of a bashing on some chat sites, but overall I think it’s a hugely positive step forward for the town centre.